Heather Braun Dahl created dahlhaus out of a love of creating beautiful objects to be cherished and used in the home. Born in 1975, Heather first took a clay and painting class in college and fell in love with both mediums. Graduating from the Emily Carr Institute of Art & Design with a BFA in Ceramics & Painting in 2001, Heather's life post-art school involved traveling and starting a family. During the next 6 years, Heather would make ceramics out of a community centre pottery studio, teach art classes to kids, and paint in her stairwell while taking care of her growing family. 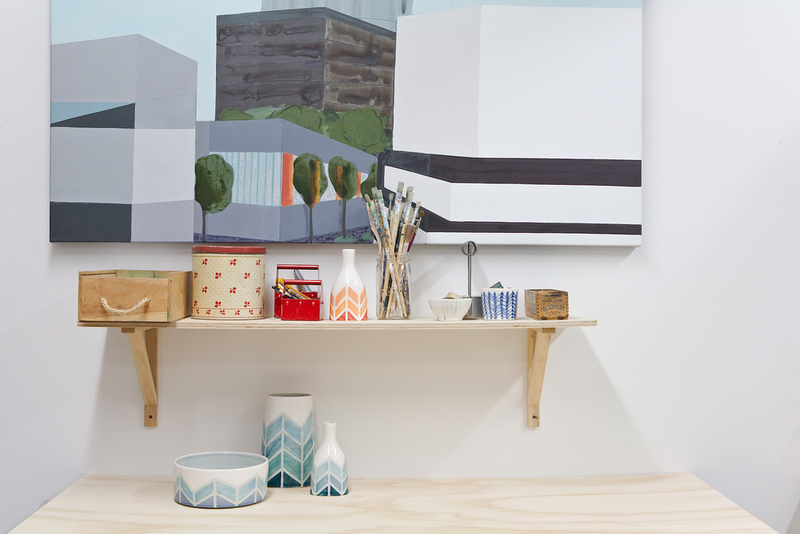 In 2007 the opportunity to take a self-employment program allowed Heather to launch her dream- a studio practice that brought both her ceramics and painting practices under one roof. Heather Braun Dahl's artwork- whether it be ceramics or painting, has been exhibited and sold through galleries and retailers all over North America. She has worked with large retailers like Anthropologie (2011) and West Elm (2012), and Nordstrom (2015) to Art Gallery gift shops like the Gardiner Museum and the Art Gallery of Alberta. Her work has graced the pages of magazines such as Bon Appétit Magazine, Canadian House & Home Magazine, Style at Home, InStyle, Atomic Ranch, Studio Magazine, and more. dahlhaus studio is part of the ceramic co-operative, located at 965 Vernon Drive, in the Mergatroid Building in Vancouver, Canada. The building itself also includes a glass-blowing and wood-working co-operative, as well as many individual artist studios. As a working studio, the studio is equipped with a wheel, and a slip-casting table, with 3 kilns that are shared with other ceramic artists in the co-op. Twice a year the studio is open to the public for an open studio sale in Spring and the Eastside Culture Crawl in Fall. Please contact Heather if you would like to come by for a studio visit if you are in the Vancouver area! Filmed by Wilhelm Films in 2012, this video shows the process of how each piece of ceramics is made!